∼ 2010 ∼ June ∼ 02 ∼ Eggplant (with a little) Parmesan! Eggplant (with a little) Parmesan! 31 years ago today, my incredibly amazing, super talented, sweet, caring, kind, loving, generous, fun and not to mention GORGEOUS husband, Christopher, was born. What a lucky day that was! I recently started cooking and he is absolutely OBSESSED with my Eggplant Parmesan. So, that is what I will be preparing for him tonight! I his honor, I would like to share with you this delicious recipe. Set out 3 bowls. One with flour (I like whole wheat flour), one with a beaten egg and a splash of water, and one with Italian breadcrumbs. Prepare a baking sheet by rubbing it with olive oil. You will cover each slice of eggplant with: first the flour, then the egg, and then the Italian breadcrumbs. Place each eggplant on your baking sheet. Put it in your preheated oven for about 7 minutes, turn the eggplant over and then bake for another 7 minutes. While that is cooking, you can prepare your pasta. I use whole wheat angle hair pasta. Boil some water, throw in your pasta, stirring occasionally, it should be ready in about 8 minutes. Drain and (if you would like) add a little olive oil. You will also want to heat up your pasta sauce at this time. Whatever you like will work. I like tomato and basil or some kind of mushroom sauce. You can also serve this with a salad. Salads are so easy and a great way to get your leafy greens! Put a couple of handfuls of baby spinach, a few grape tomatoes and some mushrooms (or whatever you like in your salad) into a bowl, drizzle it with olive oil and squeeze in some lemon juice and you are good to go! 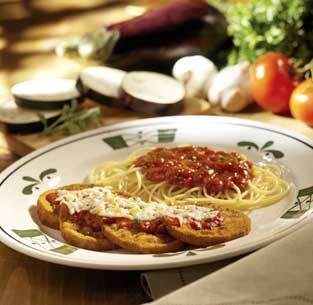 When everything is done, just arrange it on your plate the way you like and then add your sauce. Sprinkle some Parmesan cheese over the top and dig in! I wouldn’t dare forget a cake for my birthday boy! I will be baking my famous heart healthy and delicious Chocolate Lentil Cake! Happy Birthday Baby! I love you!! !